Any feature that gives a player a better chance of getting a winning combination is always going to be welcomed. That’s certainly the case with cascading reels where you really have to keep an eye on the reels and what they might just bring you when all of a sudden the positions of symbols on the reels suddenly changes. Cascading reels are so special to a player because they have the ability to give the player win after win after win. After a normal spin of the reels the game will calculate whether the end result will give you any wins. Normally you’d be either celebrating or commiserating and then preparing yourself for the next spin of the reels. However, with the cascading reels feature there’s more action guaranteed before that next spin. If that spin of the reels has resulted in a winning combination, then you have even more reason to be celebrating. That’s because the symbols that has given you a win will now be removed from the reels. Now this obviously leaves a gaping hole in the reels that has to be replaced. This is rectified by other symbols falling down to fill in those blank spaces, these in turn are replaced by other symbols. All this activity means that the reels have a completely new look to them and now the game gazes at the new-look reels and determines whether any new winning combinations have been formed. If that is the case, then the cascading reels come into play again. This will continue to happen until a new set of reels is formed and there are no winning combinations to be seen on the reels. Sometimes this is labelled as cascading wilds because of the substitution of the symbols. This kind of feature has become possible with the increase in size of slot machines. When there were simply three rows of symbols and one payline, a feature such as cascading reels simply wouldn’t have been possible as it’d probably have been providing players with wins until kingdom come. The game ‘Invaders from the Planet Moolah’ (WMS) is a prime example of cascading reels and really fits in well with the theme of the game. As you might guess it’s about aliens from another planet and they come into play when there’s a winning combination. 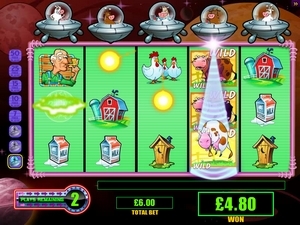 All of a sudden the aliens decide to ‘kidnap’ the winning symbols and in a flash they are transported up to their spaceship. What happens there I dread to think but this is when the new symbols drop down into the vacant spaces and take their places and of course the alien abductions will keep happening and if this happens four times it triggers the free spins bonus game. The feature can also be seen in ‘Crystal Forest’ (WMS). The pattern is a similar one but this time the winning symbols disappear in a magical way and are replaced by new ones. Again there’s the excitement of counting the number of successful cascading reels because of the possibility of triggering free spins. It’s clear then that cascading reels are really something to look out for. There’s plenty of activity with just one spin of the reels so if you play a game that has this feature, it’s definitely one that you’re going to enjoy playing.